On July 27th from 12:30-4 PM local attendees are invited to meet the lab equipment vendors and try out their demos. Vendor Exhibition Only registration does NOT include the workshops, plenary talks, or meals. Please answer the required questions on the registration form. However, questions related to housing, transportation, and workshops are intended for full conference attendees. Download the latest conference schedule. Poster abstract submission is open! Abstracts for contributed posters are due by June 15th and can be submitted at https://advlabs.aapt.org/bfyiii/. Workshop and poster presenters have the opportunity to publish a paper in the peer reviewed conference proceedings. 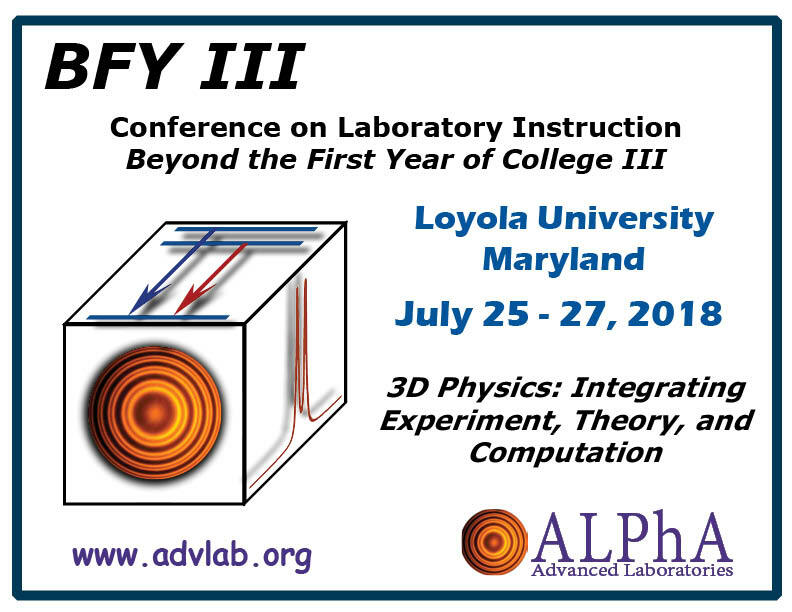 The Third Conference on Laboratory Instruction Beyond the First Year (BFY3) will be held at Loyola University Maryland in Baltimore, MD on the three days (8 AM on Wednesday, July 25, 2018 through 5 PM on Friday, July, 27, 2018) immediately preceding the 2018 Summer National Meeting of the American Association of Physics Teachers (AAPT). The goal of the BFY3 Conference is to expose attendees to a broad range of contemporary instructional lab experiments appropriate for sophomore-, junior- and senior-level college physics courses, while also serving as an opportunity to discuss a range of curricular models that allow for enhancement of the undergraduate physics major. This goal will be met through a combination of hands-on small-group workshops, plenary talks, panel discussions, poster sessions as well as informal conversations. Please check out the 2015 BFY2 Conference website if you want to see an example of what to expect for BFY3. Registration is limited to 150 attendees. The conference has access to apartment housing on the Loyola University Maryland campus for the nights of Tuesday, July 24 through Friday, July 27. The latest checkout time is Saturday morning, July 28th. Apartments have either 2 or 3 bedrooms, a living room, dining room and kitchen. Each bedroom has two beds, dressers and desks. Apartments are furnished with residential college furniture, and there is at least one full bathroom located in each apartment. The kitchens are equipped with a full-size refrigerator, oven and cooktop, but are not outfitted with utensils, dishes, pots, pans, microwaves or coffee makers. Towels and linens are provided. Attendees may reserve single occupancy bedrooms ($69/night per person) and double occupancy bedrooms ($64/night per person). Reservation and payment for dorm housing must be done as part of the conference registration process. All dorm reservations must be made by Friday, July 6th. The Radisson Hotel at Cross Keys, Baltimore (2.1 miles from conference) can be reserved at a Loyola event nightly rate of $125 plus tax for weekdays and $135 plus tax on weekends. See below for how to make reservations. Discounted group rate reservations should be made by June 24th. The Inn at the Colonnade Baltimore - a DoubleTree by Hilton Hotel (0.9 miles from conference) can be reserved for $139/night + taxes. The discount group name is Amherst College-Advanced Laboratory Physics. When searching for rooms, use the special rate code/group code AAL. Discounted group rate reservations should be made by June 24th. Free parking is available in lots near the Loyola dorms. All attendees and vendors can use these lots. The dorm parking lots are open during the summer, so no parking pass is needed. 100% refund on registration and dorm fees for cancellations up to July 11th. 70% refund on registration and form fees for cancellations between July 12-20th. No refund July 21 or later. Select the dates you are checking in and checking out and select Search. A Room Options screen will appear. Please select the bed type that you are requesting which is located at the bottom of the page. Once you select the bed type you are requesting click Continue. You are then prompted to your reservation profile page where you would input your contact and payment information. The BFY3 guests can also call Reservations: 1-800-333-3333 and say you are making a reservation for The BFY III – Alpha Advanced Laboratories – Loyola group & the dates you will be staying at the hotel.